You are here: Home » The Task One iPhone Case: A Case Study of Mobile Market Excess? The Task One iPhone Case: A Case Study of Mobile Market Excess? Tonight I was channel surfing and stumbled on the Task One iPhone Case in a TV News feature story from an outfit called Task Labs.. Their website is up but not complete. It still has the Latin text of an incomplete webpage template, but you can buy it online if you wish. The market positioning of this product according to the TV person, was simple. What do you do when you take your iPhone out into the woods with you on a hike, then realize that you have no cellular signal, no nothing. The Task One iPhone case is their answer. 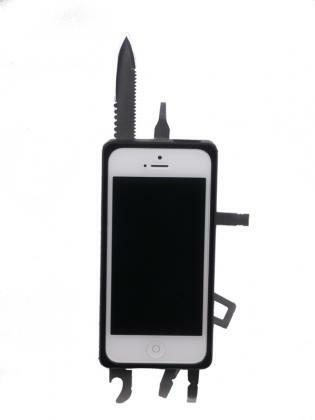 Let me know your opinion on the Task One iPhone Case. 1. Kiss Your Phone Goodbye Going Through Airport Security: This one seems obvious. I cannot count the number of Swiss Army Knives i have personally lost at airport security. Then think about the number of Swiss Army Knives they have confiscated. 2. “Small” idea. The inspiration for this product is nothing new. It is simply trying to kludge together two things that work perfectly well on their own. So the real question is why bring your phone into the bush, when you need to leave the phone home, and bring your Swiss Army Knife? I know that some people will adamantly say that you should bring your mobile phone with you for GPS, etc. Perhaps, but no mobile phone GPS system was designed for use in the bush. Take your phone with you on a long hike, and try to use your GPS and you will see what I mean. Nor is a useful pocket knife designed to look like a phone. The Task One is a marginally useful appendage to a mobile phone, that will not fit comfortably in the palm as a knife does. It encourages a sense of complacency in the bush, when serious backcountry experts would probably laugh. Or is it for use to impress your friends, out on a Friday night at the local pub? The accessories appear to include all kinds of cool extra stuff, like a battery charger (Huh?). So as long we are brainstorming this product, it needs a compass. A mirror would be good. Remember all of the movies where the guy lost in the woods uses a mirror to signal rescuers? Any other suggestions? 3. Price. The price is $99. I can buy a comparable Swiss Army Knife for $30. Are you prepared to pay $99 for an iPhone case? Not sure about the price of the accessories. 4. The Market. The market may seem big, but wait a minute. Most smart mobile phones have different form factors, even the iPhone 4 and iPhone 5. So Task One and Task Labs must address a fragmented market with multiple products. This is starting to sound very complicated and expensive. Can I get one for my Samsung Nexus? No. 5. Marketing. I think that this company, like so many of these giddy mobile market companies, is so full of itself that it hasn’t thought through the distribution issues, including a half finished website. The very fact that when I first saw the TV story, I assumed that it was a spoof, is a warning signal. I published “Silicon Valley’s Misguided Love Affair With An App For Everything, ” and “App Development Boom’s Depressing Underbelly” after reading a New York Times story on the topic.